Art Design: Librarians' Internet Index provides access to over 200 links to historical and contemporary art design sites. 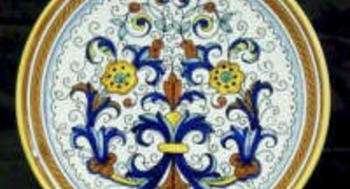 Ceramics: Librarians' Internet Index links to myriad excellent sites for ancient, historical, and contemporary ceramics. The Louvre: Access this famous museum. Metropolitan Museum of Art: Access one of the finest museums in New York City. The Smithsonian: Art, science, history, etc. The Internet Broadway Database: "The official archival database for Broadway theatre information...provides records of productions from the beginnings of New York theatre until today." Justin's Drama and Theatre Links: A large collection of links to all aspects of theater, including history, practitioners, genres and styles, playwrights, scripts, companies, stagecraft, costumes, education and curriculum resources, and much more. Leonard Berstein's "West Side Story": Find out all about the history of this important composer and his famous musical. Neil Simon, Playwright: PBS site for information about the creator of "The Odd Couple." The Official "West Side Story" Website: Great information about one of the very best musicals - ever. Performing Arts Links: Links to wonderful resources on costuming, scene design, sound, etc. Perspectives in American Literature: Contains detailed background about Neil Simon who wrote the play, "The Odd Couple." TheaterMania.com Contains "listings, news, reviews, interviews, video content and online ticketing for Broadway, Off-Broadway, Off-Off-Broadway and theater nationwide." 8notes.com:"This site offers over 1500 free sheet music pieces and riffs. The music is browsable by category (classical, popular, film television, traditional, etc.) and by instrument, and is searchable by composer, title words, and instrument." 120 Years of Electronic Music: "This site charts the development of electronic musical instruments from 1870 to 1990. For the purposes of this project electronic musical instruments are defined as instruments that synthesise sounds from an electronic source." Allmusic: From the publishers of the standard print reference All Music Guide, this site contains ratings and reviews of more than 400,000 record albums. Search by artist, album, song, style, or label. Broadway: The American Musical: Companion to a Public Broadcasting Service (PBS) "documentary series that chronicles the Broadway musical throughout the 20th century and explores the evolution of this uniquely American art form." Musicals101.com The Cyber Encyclopedia of Musical Theatre, TV, and Film: "This site's purpose is to be 'a reliable educational resource celebrating the history of musical theater, film, and television.'" Musictheory.net: A collection of music theory tutorials. Lessons include staff, clef, and ledger lines; note and rest durations; measures and time signatures; major and minor scales; and more. OLGA: The On-Line Guitar Archive: A collection of chords and tablature for thousands of songs sent in by Internet users. World Wide Music Resources: Biographies of musicians and groups, genres, etc.